It may come as a shock to those who follow me on Facebook that I was a reluctant convert to the social media. Although I now consider the time I spend monitoring my page and personally responding to comments to be well worth the effort, there was a time when I was conflicted as to whether or not I should join. I am a rather private person by nature, and that, combined with my belief that the No Kill movement should first and foremost be a movement of ideals and not of personalities all added to my reluctance. But the more I researched the issue, the more I understood the value of having such a wide-reaching, democratic tool to not only educate people about the No Kill movement, but to personally respond to many of the myths and misperceptions that exist about the movement, too. What I didn’t anticipate was the window it would give me into how I am often misperceived, as well. It has become a pattern that whenever I post a blog or article about PETA’s killing, or how the ASPCA or the Humane Society of the United States have betrayed the cause they theoretically exist to promote, individuals uninformed about the No Kill movement or my history within it will respond to what is often shocking news about groups they have historically admired by questioning my motives and my allegiances. Often, these accusations are no doubt the result of a brief internet search of my name, searches that turn up fabrications about who I am, what I am trying to accomplish, and whose interests I really represent. I have been falsely associated with industries and interest groups that harm animals, such as the meat industry and the Center for Consumer Freedom. I have been accused of being in league with breeders, such as the American Kennel Club. Self-identified animal “activists” have responded to my reports about PETA killing animals, or condemning HSUS’ sordid role in the Michael Vick case, by accusing me of trying to destroy the animal rights movement or not caring about animals beyond cats and dogs. To my bewilderment, I have even been accused of hating rabbits and deaf animals. I am grateful to have the opportunity through social media to set the record straight. For in every way except the truth, those who oppose No Kill have a competitive advantage. The organizations I criticize are large. They are powerful and well-known to many people. Their public image, often so at odds with the practices in which they engage behind closed doors, such as PETA’s deliberate poisoning of thousands of animals every year or the ASPCA and HSUS’ efforts to derail progressive shelter reform legislation in states across the country, shields them from accountability. The No Kill movement is relatively new, the traditional sheltering establishment and the national organizations that provide them political cover are just that: established. They are old organizations with pedigreed names and reputations while the No Kill movement and my organization, the No Kill Advocacy Center are, by comparison, relatively young. Basic human nature tends to jealously guard the familiar and the status quo, and so when it comes to winning the battle of the first impression, I face an uphill battle. People, upon first encountering news regarding the true nature of our nation’s animal protection organizations, are inclined to assign the groups I criticize the benefit of the doubt, and me, the burden of it. Although most of the comments on my Facebook page come from No Kill supporters who share my heartbreak and dissatisfaction with the state of our nation’s shelters and the leadership of the large, national groups that enable their abuse and killing, there are enough comments of a particular nature from incredulous people who have never encountered me or the No Kill message before to warrant a response. To those who read my Facebook posts and blogs for the first time and become so upset that—rather than research, accept as verifiable facts and then assimilate the information I report as a true commitment to the well-being of animals demands—choose instead to shoot the messenger, I would like to answer the charge either stated or so often implied by their hostile comments: Just who in the hell do I think I am? I want to answer this question because although, as I stated, the No Kill movement should be first and foremost a movement of ideals and not of personalities, there are too many people who find solace in dismissing the No Kill message based on misinformation about me that my duty to the animals demands clarification. Although, in the end, it should not matter who is right, but what is right, and although an idea should be judged not by the person who is delivering the message but by its own merits, that, sadly, is not the way some humans are inclined to work. Too often, people seeking to be lulled back into a complacency that does not threaten their view of the animal protection movement and organizations and individuals they have historically lionized seize on criticisms of me as justification to dismiss the news I uncover and write about. I don’t want that. I don’t want lies about me to get in the way of the needs of animals. Nor do I need to accept it, either, because I am not and never have been what my detractors claim I am. For although I and the news I uncover may be new to many people, I am not new to the animal rights movement, and have, in fact, been active in it for the past 20 years. How it is I came to be the most vocal and outspoken critic of its hypocrisy is the result of my experiences within the movement, experiences that left me no choice but to publicly expose the groups for what they repeatedly demonstrated to me over and over again they really were. If some people are disinclined to believe what I report about PETA, HSUS or the ASPCA, are inclined to believe rumors that they have heard that I am a front for animal abusers or that I seek to destroy the animal protection movement, here is my story, the back story that places my efforts into an historical context. It is my hope that by recounting my journey in the animal protection movement, they will gain a perspective that not only leads them to view my opposition to the national groups as they now exist as not only understandable, but morally obligatory as well. 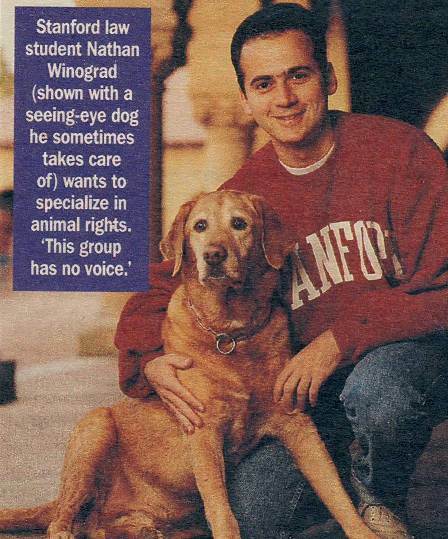 From a 1993 article in Parade magazine, on the emerging field of animal law. When I arrived at Stanford Law School in 1991, I was trained in journalism, having studied it in college, was an editor for my college newspaper, and interned at a news organization. I was also already a vegan, a long time rescuer and TNR advocate. I knew that when I graduated, I wanted to devote my life to helping animals through the power of the written word and through the law. It was, in fact, the reason I went to law school. Anxious to begin furthering the cause of animal rights even as a student, I founded a campus animal rights group, the Stanford Animal Protection and Education Society, or Stanford APES for short. We leafleted in the quad, urging other students to embrace a more humane diet. We leafleted in front of zoos and aquariums, urging patrons to oppose animals kept in captivity. And we were a thorn in the side of the vivisectors at Stanford, exposing not only the cruel experiments that were taking place there, but the deplorable housing conditions for the animals as well. 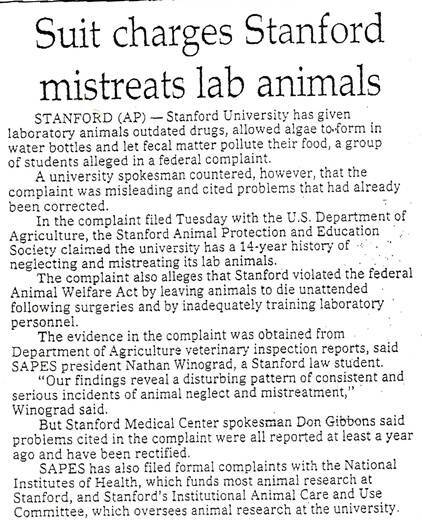 Employing the skills I learned as a journalism student, I also requested, researched then publicly exposed damning USDA inspection reports of Stanford animal research facilities to the faculty and media. I also served on the Board of Directors of the No Kill Palo Alto Humane Society, helped found CatWorks, an organization that provided care for 2,000 feral cats across the Bay Area, worked with the National Greyhound Protection League not only to end the scourge of greyhound racing, but to find homes for retired greyhounds, and I was a member of the Stanford Cat Network, a group of Stanford advocates who cared for the free-living cats on campus, cats and their offspring who had been abandoned by the transient student population. It was through this affiliation that I was first introduced to the dysfunction of the animal protection movement itself, and, by extension, the cause that would come to define my efforts on behalf of animals for the next two decades. 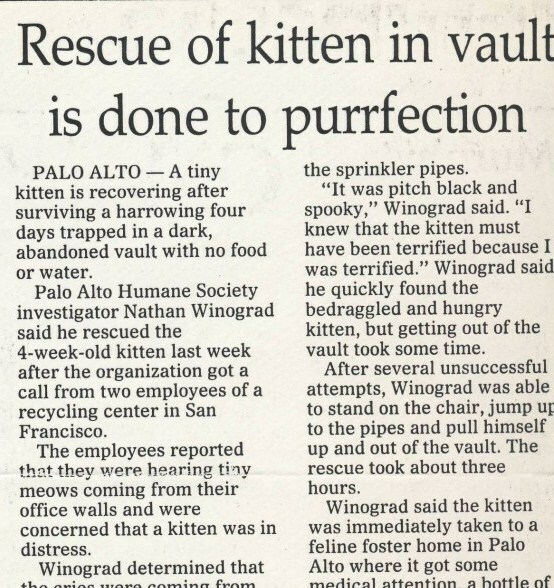 When Stanford announced plans to round up and kill the cats living on the campus and cat lovers turned to the local Santa Clara Humane Society and then HSUS for help, these groups supported Stanford’s extermination campaign. They agreed that killing the cats was the right thing to do, and urged the school to trap the animals and inject them with a fatal dose of poison. That these groups would advocate such a position stunned me. I didn’t understand. Little did I know that this was the first of many, many times I would be bewildered, shell-shocked in fact, by the pro-killing positions that groups which claimed to be the leading voice for animal protection in the nation would take, over and over again. My work with the Cat Network introduced me to the No Kill movement, and by extension, the San Francisco SPCA. Just 30 miles from the Stanford campus, the San Francisco SPCA was, at that time, the leading voice of the No Kill movement and I wanted to be a part of its success. Although I was also a full time law student, I took a job working in its Law and Advocacy Department. It was my job to defend the animals being threatened with killing within San Francisco’s borders, to expand the safety net so we could save more, and to promote the new and innovative programs the San Francisco SPCA was creating, programs that were transforming San Francisco into the safest community for homeless animals in America—which, paradoxically, made it the target of criticism by local shelters and, once again the large, national animal protection organizations, too. As an animal lover and animal rights advocate and a journalist, my experiences working at the SF/SPCA were life altering. I felt privileged to be witnessing history in the making, to be a part of an organization that was redefining animal sheltering and that was successfully tackling one of the many ways in which animals were losing their lives by the millions in America. I understood that the SF/SPCA was starting a revolution, and I was honored to be a part of it. But few others within the larger animal protection movement at that time grasped or appreciated its seminal achievements. Rather than celebrate the SF/ SPCA’s lifesaving success, virtually every animal protection group either ignored it or openly condemned it. They criticized each program the SF/SPCA experimented with that provided an alternative to killing, programs that have since moved beyond controversy, calling TNR “subsidized abandonment,” calling offsite adoption venues “sidewalk giveaways,” calling foster care “a sham that delayed killing,” and calling No Kill itself “smoke and mirrors.” The leaders of the large national groups such as the ASPCA and HSUS argued that any talk of saving the lives of animals in shelters was pure nonsense, that “the only solution” to animals in shelters “is the blue solution,” referring to the blue color of the barbiturate, sodium pentobarbital, that shelters use to kill animals. HSUS sought to undermine the spread of the SF/SPCA model by publishing false and misleading information about the SF/SPCA in its national publications, information they refused to retract when confronted with their misinformation and asked by SF/SPCA leadership to do so. 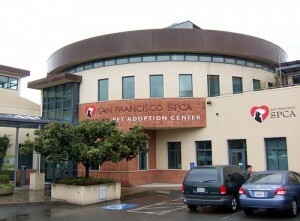 Local Bay Area humane societies, likewise threatened by the success of the SF/SPCA, also mercilessly attacked it for saving, rather than ending lives, suggesting that the SF/SPCA was lying about its success, calling it derelict in its duties for refusing to kill, and vowing to prevent what was happening in San Francisco from spreading to their community. To say that these experiences left me disillusioned with the animal protection movement would be an understatement. But it was nothing compared to the shock I experienced when I learned that not only did the group that up until that point I had naively revered as the most stalwart defender of animal rights in the nation, PETA, share these disturbing views, but was, in fact, its most vocal and outspoken mouthpiece. During the first of two summers I would serve as the law student intern for the Animal Legal Defense Fund, I would learn this lesson up close and personal. With an office located in the greater Washington, D.C. metro area, the ALDF office where I worked was not far from PETA headquarters. My roommate, in fact, was a former PETA employee, a member of PETA’s inner circle, someone who spearheaded the campaign against Revlon’s animal testing that would introduce millions of Americans to the ugly LD50 test and put PETA on the national map. She was also a close acquaintance, if not personal friend, of Ingrid Newkirk, the founder and President of PETA. Together, we would volunteer at PETA one night a week, stuffing envelopes for mailings (she leading the volunteers; me stuffing envelopes with the others). One day, she rescued a dog we named Ray. He was a wonderful dog, a young and healthy German Shepherd, with a playful disposition. When I suggested that we take Ray to PETA, certain that with their vast resources and ability to communicate with hundreds of thousands of animal lovers nationwide that they could easily find Ray a new and loving home, she explained that that was a bad idea because Newkirk would kill him. Come again? Did I hear her right? And that is when she explained to me what had been going on within PETA at that point for many years already—activities that for the next 20 years I would watch continue unabated. She explained that PETA routinely killed the animals that are brought to them, and equally egregious and perhaps even more disturbing in the blood thirst it revealed, that PETA also actively sought out animals to kill, thousands of them every year. Another bombshell to my innocence, another piece of information that helped me to more fully grasp the level of dysfunction and perversion within the animal protection movement, for I learned then and was to discover in the coming years that not only does PETA kill animals, but that they advocate for the immediate destruction of all feral cats and dogs who looked like Pit Bulls, too. I learned that Newkirk considers life suffering, that animals want to die and that to kill them is to give them, in her own words, “a gift.” I learned that she does not believe that animals have a right to live (once sending me a postcard which read, “We do not advocate right to life for animals”) even though the right to live is in fact the most basic and fundamental right of every animal and serves as the basis for the entire animal rights philosophy. I learned that she recruits legions of activists to her insidious cause, people who drive around the Eastern seaboard in donor-funded vans, acquiring animals from various sources—free to good home ads, rescue groups uninformed of their real agenda, and animals displaced by natural disaster—only to kill some of those animals immediately in the back of those vans, stocked to the hilt with tackle boxes full of bottles of poison, syringes to inject that poison into animals, and garbage bags to hold their corpses after they take their last breath. I learned that animals who are not killed on the road are taken back to PETA headquarters in Norfolk, Virginia where they are killed, their furry bodies then stacked high in a freezer PETA has installed for this very purpose—a place to store the piles of dead bodies they accumulate between donor-funded visits from the renderer who takes their bodies away for incineration. I learned that dogs and cats weren’t the only animals to fall victim to PETA, that they killed wild animals, chickens, and rabbits, too. Indeed, in their thirst to kill, PETA employees do not discriminate on the basis of species, that for all their talk about the veganism they would not hesitate to kill a chicken if they had the opportunity to do so. And I learned that killing animals themselves was not the only way PETA sought to end their lives; they encouraged others to kill them, too. When I approached Georgetown University about starting a TNR program modeled on Stanford’s, they refused, indicating that PETA—urging them to reject TNR—gave them their blessing and encouragement to kill. 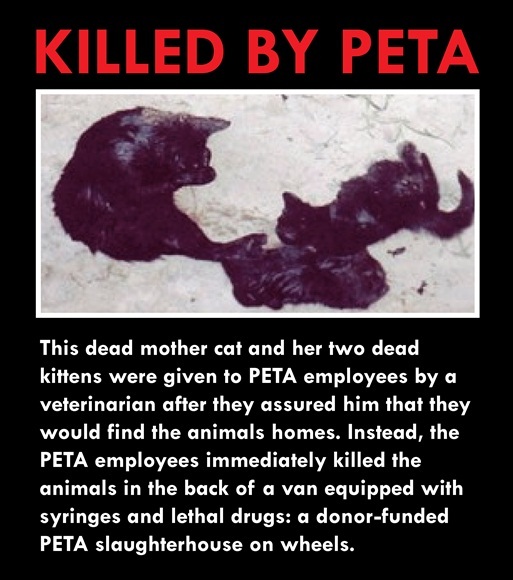 In the end, PETA succeeded in having the cats rounded up and killed, a move that resulted in cat lovers finding neonatal kittens left to slowly starve to death throughout the campus after their mothers had been trapped and taken away. And I would spend the next 20 years watching PETA repeatedly come to the defense of regressive, cruel shelters under attack by No Kill reformers, watch PETA track No Kill reform efforts nationwide, efforts they would try to undermine with local letters to the editor and to political bodies which were debating shelter reform efforts, letters that equated No Kill with hoarding and animal suffering and which called No Kill reformers “fanatics,” urging them to oppose lifesaving measures in favor of the status quo of killing. To find that what I had believed PETA represented was in fact the opposite of how it behaved was a bitter pill to swallow. It not only broke my heart, it filled me with anger and resolve. What choice was there but to refuse to tolerate such treatment of animals? What response was there but to reject such perversion, to speak out against it, to try to bring such a cruel and deliberate slaughter of innocent animals to an end? That, after all, was why I became involved in animal rights in the first place: to protect animals, regardless of the context in which they were exploited and killed and irrespective of who it was that was doing the killing. But I was to learn another sad truth that summer, and that was that in my condemnation of PETA, I was in the smallest minority. I learned that the truth about PETA was common knowledge among those who worked in the animal rights movement. 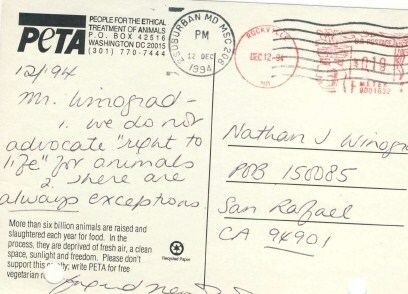 I learned that the leader of every other self-professed “animal rights” group knew what was really going on at PETA, but never spoke out against it or against Ingrid Newkirk herself. In fact, they took Newkirk’s telephone calls, they would shake Newkirk’s hand when they met her and they would all make excuses for her, granting her absolution to kill with the tortured logic that since she had seen so much animal suffering she should be allowed to kill animals herself. In other words, that her efforts to protect animals had earned her the right to harm them. These people, who worked in jobs that were supposed to eliminate animal killing, condoned and enabled it simply because they knew the person doing it, even going so far as to celebrate Newkirk by inducting her into the “Animal Rights Hall of Fame.” In the early 1990s, this attitude towards PETA’s killing was held by virtually everyone I met who worked in or volunteered at an animal rights group, with rare exception. 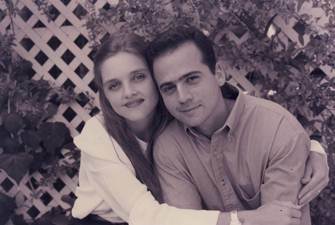 One of those rare exceptions was the woman I would eventually marry, my wife of 17 years, Jennifer. Jennifer worked at the ALDF main office near San Francisco, and as the D.C. office’s law student intern, I had spoken to her on the telephone several times. But it was not until a meeting of a small, grassroots group we both joined to defeat two pieces of deadly anti-cat legislation pending in the California State Assembly that we first met face to face: A law introduced at the behest of Wayne Pacelle’s Fund for Animals, an organization that has since merged with Pacelle’s HSUS, which would have authorized the round up and killing of homeless cats. And another, introduced with the support of Pacelle’s organization, which gave animal control officers the power to kill cats immediately in the field if they did not have proof of a rabies vaccination. Since cats can’t provide this information themselves and many do not wear a collar and rabies tag, the law would have led to a bloodbath of feral cats, of pet cats, of any cat an animal control officer found outdoors without a rabies tag. Determined to protect cats by defeating these deadly bills, a small group of us banded together to successfully fight them, a group which included Jennifer, who not only did cat rescue in her spare time, but volunteered at the San Francisco SPCA, too. A vegan, an animal rights advocate and No Kill supporter just like me, we hit it off immediately, and have been together ever since. When I met Jennifer, she had been working for ALDF for several years. Prior to that, she had worked at In Defense of Animals, and not long after we met, she also went to work, though briefly, for Farm Sanctuary, primarily as an investigator. I, too, would later do work for Farm Sanctuary, as a volunteer pro bono attorney. Although we recognize that our prior involvement with well-known animal rights groups would establish our connection to the animal rights movement and thereby help to dispel some of the criticism and conspiracy that we are “outsiders” trying to undermine animal rights, the truth is we rarely mention these groups or our historical association with them for a reason. They, like virtually every other self-professed animal rights group in the nation, have ignored the plight of animals in shelters, failed to celebrate the No Kill model, and have continued to turn a blind eye to the atrocities committed by animal shelters across the nation and by PETA. Although our early history in this cause clearly demonstrates that we come to No Kill not as breeders,* as shills for the meat industry or any interest group which represents those who harm animals but, rather through the cause of animal rights itself, we do not wish to be associated with groups that do not embrace an authentic animal rights agenda—one that includes rights for companion animals, too. Sadly, though our once personal association with these groups has meant that their failure to champion No Kill or to speak out against PETA’s atrocities has been particularly disappointing, in truth their failure to do so is not surprising. It is, in fact, the norm among animal rights groups, a tragic and paradoxical position born of the nature of the founding of the animal rights movement itself. In fact, to this day, efforts that focus on dogs and cats are often viewed with disdain in the animal rights movement and somehow “less animal rights” than other issues. Many animal rights activists erroneously believe the thousands of shelters across this country are in fact meeting the needs of these animals who therefore require no further advocacy or attention on their part when nothing could be further from the truth. Not only is shelter killing the leading cause of death for healthy dogs and cats in the United States, but our shelters are in crisis, plagued with animal abuse and neglect as well. But few in the animal rights movement are aware of these tragic facts because the people and organizations they trust to keep them informed about important issues affecting animals refuse to do so when the victims are not on farms or in laboratories, but inside our nation’s animal shelters. Today, healthy debate within the animal rights movement is discouraged in favor of “movement unity” and deference to the agendas promoted by large, powerful organizations. 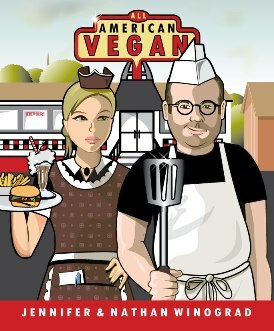 It is a top-heavy movement—and therefore intolerant of dissent, suspicious of change and prone to censorship (just try to get a vegan cookbook critical of PETA reviewed by VegNews or popular vegan bloggers, they won’t do it in deference to PETA and its killing agenda.) While many animal rights activists, lacking a sophisticated understanding of the pressing need for No Kill reform, underestimate and dismiss the cause as a mere “animal welfare” issue, leadership of animal rights organizations are not so naive and are far more calculating. They willfully ignore the No Kill movement and fail to champion its more widespread implementation precisely because it challenges the historical narrative and those who have perpetuated it that has explained and condoned shelter killing since the movement’s inception. In the animal rights movement today, innovations that threaten the prevailing paradigm and those in power are rejected in favor of the status quo. Consequently, there is no mention of No Kill in the newsletters of large animal rights organizations. It is unlikely to be found on their websites, on their Facebook pages, or any of the other ways these organizations regularly communicate with their members or the grassroots, except—in the case of PETA—to denigrate it. Likewise, because the guidelines of animal rights conferences mandate that speakers not criticize other animal protection organizations—even when doing so is required to expose their actions which harm animals and deny them their rights—No Kill advocates are under a gag order that prevents them from sharing the true causes of shelter killing as well as its proven cure—rejecting old philosophies and those who embody them. Within the animal rights community today, it is not what is right that matters, but who is right—even when they are clearly wrong. As a result, many animal rights activists continue to parrot the charade that the killing of innocent dogs and cats is acceptable, consistent with their beliefs that one should never kill pigs, cows or chickens. This collective silence combined with an historical embrace of both the excuses used to rationalize the killing and those who promote them have coalesced to render the No Kill movement essentially invisible to most animal rights activists, except when it is being bashed and misrepresented by PETA. The so-called leaders of the animal rights movement keep grassroots activists ignorant and impotent, denying them the information necessary to see through PETA’s nefarious agenda and the tools they could use to assure lifesaving success at the shelters in their own communities. That is why, although the No Kill movement is having tremendous success tackling one the ways in which millions of animals lose their lives in this country every year, most animal rights activists are unaware of this success. It is why, though savvy No Kill advocates understand that pet overpopulation is in fact a myth, open-admission animal control facilities now exist throughout the nation, and that there is proven cure to shelter killing, many animal rights activists do not. Indeed, although most animal rights activists consider themselves on the cutting edge of animal protection, when it comes to companion animals, they are, in truth, regressive, perpetuating antiquated and disproven dogmas that defend and enable, rather than challenge, the wholesale slaughter of certain species of animals. And it is also why, when they encounter me and my message for the first time, they so often respond with incredulity, disdain and personal attacks. I am often called divisive, unreasonable, and a liar. I am accused of being a shill for puppy mills and agribusiness. Ingrid Newkirk has accused me of being out to destroy the animal rights movement. One of the most common criticisms I hear is that we are all a part of the same cause, should work together, and best serve the animals by getting along rather than fighting. In fact, whenever No Kill advocates expose the many ways in which HSUS, the ASPCA or PETA undermine efforts to save lives, betray the mission they ostensibly exist to promote, kill or cause animals to be killed, there are invariably those who come to their defense by stating that these organizations should not be criticized because they “do so much good for animals.” It is a tragically commonplace argument, but no less indefensible because of it. In effect, they are arguing that because some of the money donated to these organizations may actually be used for its intended purpose, that they have earned the right to cause harm to other animals themselves—terrible, irreversible, life-ending harm. The fact that those who most commonly make these arguments are people who support these organizations because of their professed missions and would therefore likely self-identify as “animal lovers” is as troubling and paradoxical as the argument itself. Sadly, for such people, a misplaced trust and need to identify with such groups or the people who work at them at some point became more important than the professed values that presumably led them to support these organizations in the first place. The ideals that animals have rights and interests independent of humans—including the right to be free of suffering and the right to live—are casually discarded so long as those causing the suffering or death are self-proclaimed members of the animal protection movement. Indeed, this argument is problematic precisely because it promotes the harmful idea that under the right circumstances, animal abuse or killing are acceptable. That is, as long as the harm is being done by the right people or balanced by a counterweight of good, there is no harm that is in and of itself inherently wrong or unacceptable, effectively eviscerating the philosophical foundation of the cause. Moreover, by arguing that we should ignore or overlook certain forms of animal abuse or killing as “payment” for some perceived “good,” the door is opened to condone all manner of animal cruelty and exploitation. By this same logic, were a slaughterhouse owner to donate a percentage of his profits to a vegan advocacy organization, or a dog fighter to donate some of his winnings to a companion animal rescue group, the killing and cruelty they inflict upon animals would therefore be rendered acceptable, the harm being cancelled out by the good. Though an obvious absurdity, time and again self-professed animal lovers and animal rights activists postulate this exact scenario, but in the reverse. And not only does this argument capriciously surrender the welfare of animals and the principles which should guide all advocacy on their behalf, but it also hinders the cause by setting the bar for these organizations at a dismally low—in fact, counterproductive—level. In condoning behavior that is the antithesis of the cause such organizations are supposed to be advocating, this argument promotes the defeatist mentality that we have no right to expect or demand that our animal protection organizations be what they claim to be in practice as well as rhetoric, when of course we absolutely do. For although those who make this argument seemingly lack the vision or passion for the cause necessary to imagine a future in which animal protection organizations are authentic and unadulterated forces for good, we do not need to accept nor tolerate some harm of animals in one sphere in order to promote their well-being in another. The corruption at these organizations is neither inherent, nor inevitable. It has been fostered by various historical, financial and sociological factors that the leadership of these groups would be forced to address and overcome if animal lovers stopped making excuses for the betrayals and funding them with their donations. Some animal suffering and some animal killing are not and never have been the price we must pay to end other animal suffering and killing. In fact, as the faulty logic of that statement clearly demonstrates, to believe so is to surrender to a self-defeating, hopeless tautology that can never succeed in eliminating that which it also perpetuates. Indeed, how can a rights-based movement ever hope to win the rights that the very people leading the cause have admitted they do not believe in and even actively oppose? How can the animal rights movement in its current manifestation claim to authentically speak for animals when it is advocating the opposite of what some animals could say if they could speak for themselves? Moreover, the criticism that No Kill advocates should never speak out against those in position of power misses the mark for other reasons as well. Such comments are deeply misinformed about the level of abuse—the slanders and ad hominem attacks—No Kill advocates have suffered at the hands of the large national animal protection groups for nearly 20 years, a hostility I have personally witnessed and been the recipient of again and again. PETA calls No Kill advocates “dangerous,” “fanatics,” and “slow kill hoarders.” The ASPCA says we are “hoarders” and “dog fighters” in disguise. And HSUS says we are “crazy,” “mean-spirited,” and “divisive.” Sadly, what I have realized people often mean when they admonish No Kill advocates for telling the truth about the large national groups or the people who work at them is not that no one should criticize, they are in fact criticizing by making such comments, but that no one should question those in positions of “authority”—a notion which my early and ultimately futile attempts to work within the movement to foster change taught me is a recipe for stagnation and continued killing. When I graduated from law school in 1995, I was soon to discover that making a living as an animal rights attorney was difficult. Given my heavy law school debt, economic necessity compelled me to take a job as a Deputy District Attorney, where I satisfied my longing to help animals by becoming the “Dog D.A.,” taking on animal cruelty cases to ensure that they were treated with the gravity they deserved while doing part-time consulting work for the SF/SPCA as needed. At a time when most courts were giving cat and dog killers a slap on the wrist, I found ways to charge them with special circumstances (such as the use of a deadly weapon when an individual killed a dog using a guitar string, thus mandating state prison) or charging someone with arson of property, rather than just animal cruelty, for burning a cat to death, a violent felony which would have given him eight years in state prison and his second strike. But after several years working as a criminal prosecutor, when the opportunity to return to SF/SCPA full-time presented itself, I took it. Moving away from the programs that had made it so successful, the San Francisco SPCA replaced nuts-and-bolts programs that were the underpinning of the SPCA’s lifesaving efforts at an astonishing clip. In their place, partnerships with the University of California at Davis for fee-for-service behavior counseling, as well as architectural plans for a twenty million dollar fee-for-service specialty veterinary hospital were drawn up. And esoteric conferences on animal spirituality and telepathically communicating with animals, which catered to a more affluent, “new age” San Francisco crowd, were held at great expense—in luxury hotels or in posh vacation places like Jackson Hole, Wyoming. Within a few short years, the SPCA’s feral cat program was virtually abolished. The spay/neuter clinic … restricted its hours, significantly raised fees and, at one point, even closed its doors. On a day that came to be called “Black Monday,” the legions of feral cat caretakers who made their regular pilgrimage to use the services of the spay/neuter clinic were turned away… Plans to phase out programs in the animal hospital for indigent clients and homeless animals were in full swing. Entire departments, including those which protected the city’s wildlife, worked to find apartments for renters with pets, and advocated for stronger protections of animals, were eliminated. The crown jewel of the No Kill movement quietly passed into obscurity. At that point, Jennifer and I faced a choice. I could return to the law, sacrificing the cause that gave our lives such purpose and direction, or we could take a bold step and leave our beloved Bay Area, sell our house and move our two dogs, 26 cats, four year old daughter and infant son to whatever community was willing to take a gamble on my determination to create the nation’s first No Kill community through the model that the SF/SPCA had forsaken. We chose the latter when the upstate New York community of Tompkins County offered me the job as Executive Director of the local SPCA which ran animal control for all 10 towns and cities of the county. On June 11, 2001, literally the day I started, the killing came to end in Tompkins County and that historic milestone was crossed. From day one of my job as Executive Director, the TC/SPCA began saving rather than ending the lives of the animals in its care, using, then expanding, on the San Francisco model of sheltering. It was not without its challenges. 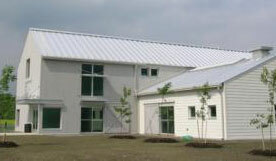 No one had ever taken a full-service open admission shelter and operated it as a No Kill shelter. How do you rehabilitate a dog who has been chained her whole life and is globally under-socialized and resource aggressive? How do you operate beyond capacity and prevent the spread of disease? How do you save all the motherless neonatals coming through the doors? How do your provide lifesaving surgery for emergencies 24 hours a day, seven days a week? And how do you save them all when in addition to dogs and cats, puppies and kittens, you are also getting hundreds of rabbits, birds, mice, rats, hamsters, gerbils, guinea pigs, lizards, chickens, horses, even a stray cow, while running an inherited $124,000 per year structural deficit in a shelter built decades earlier to warehouse and kill animals? There was no model in existence; even San Francisco did not go that far, the field of dog rehabilitation was in its infancy and every veterinary college was telling shelters it could not be done. But I was determined to do it anyway. I impaneled a committee of some of the most respected veterinarians in the nation: a Cornell epidemiologist, the head of the Cornell Feline Health Center, and a veterinary behaviorist. I told them I was going to double up dogs and cats, I was going to mix litters, I was going to operate at well beyond capacity, and I needed them to help me do it. “It can’t be done,” they said. “It will cause stress and disease.” I told them it was their job to help me figure out how to do so without stress and disease. “It can’t be done,” they said. I told them to figure it out, anyway. Together, we did. We reduced killing by 75% while reducing disease rates and deaths in kennel by over 90% from the model I inherited. At the same time, we went from a $124,000 a year deficit to a $23,000 surplus as the animal lovers of Tompkins County rewarded our efforts with tremendous financial generosity. I served as the Executive Director of that agency for three years, helping to build a firm and lasting infrastructure, including building the nation’s first green-certified animal shelter, and solidifying a shelter culture which I hoped would allow No Kill to continue even after I left. For I was determined to eventually focus my time and energy on a singular mission: spread the No Kill model to shelters across the nation. In this effort, I was again alone, because in spite of the success of the TC/SPCA and my efforts to promote it nationwide through my newly formed organization the No Kill Advocacy Center, the national organizations behaved as though No Kill did not exist in Tompkins County. They continued on as before, mired in disproven dogma that justified killing, blind to existing No Kill success and the valuable lessons it held for every shelter in America. My pleas went unheeded, and I never received even the courtesy of a response to my communications introducing this new form of animal sheltering (a model I call the No Kill Equation) or to my letters protesting their regressive policies and philosophies which were the backbone of the traditional kill-oriented sheltering paradigm. After years of futilely trying to appeal to their better natures only to have my overtures ignored and my reputation repeatedly degraded (I’ve been quietly writing to Wayne Pacelle for 15 years), I realized my efforts were in vain. I realized that these organizations weren’t interested in changing. Staffed with former animal shelter directors and employees who themselves failed to save lives, they were threatened by the success of the No Kill Equation, and were dedicated not to ending the killing of animals in shelters, but to protecting their friends and colleagues currently running shelters who were likewise failing to do the work necessary to save rather than end the lives of the animals in their care. This awareness helped me to understand that in the absence of a personal conviction to end the killing, there was simply no motivation for the people working at these groups to try to do so. As long as the American public was ignorant that a life-saving alternative existed, the failure of these organizations to embrace the No Kill Equation did not matter. Unaware of evidence to the contrary, people believed them when they portrayed the problem of shelter killing as insurmountable, inevitable, and necessary and therefore donated to them in spite of the killing. That is when I realized that in my continued and failed attempts to appeal to these groups for change, I was acting in vain as animals needlessly died. I came to understand that if I wanted to reform an industry and a movement that had no interest in reforming themselves, I would have to do it from the outside, in. I resolved to take my message directly to the animal loving American people who would then force their local shelters and these groups to embrace the change they so stalwartly opposed. In addition to returning to my collegiate roots, I became a chronicler of the animal protection movement through the power of words: articles, OpEds, blogs, and eventually books, film, and social media. 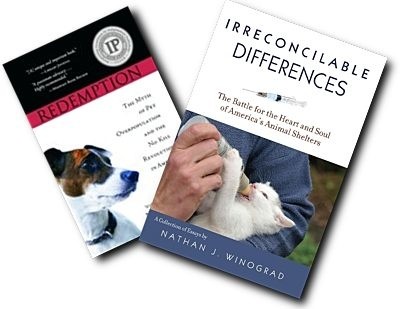 In 2007, I released my first book, Redemption: The Myth of Pet Overpopulation & The No Kill Revolution in America. It tells not only the story of the early founding of the humane movement in North America by the great Henry Bergh and how his noble legacy was betrayed when SPCAs and humane societies took over the job of killing animals they were founded to protect, but the story of San Francisco’s success, then Tompkins County’s. Challenging the myths and dogmas that had built up over the years to justify and excuse shelter killing, Redemption, and its follow up Irreconcilable Differences: The Battle for the Heart & Soul of America’s Animal Shelters, spoke to the experiences of shelter volunteers and rescuers throughout the country who were weary of the killing and weary of the hostility they, too, experienced when trying to reform deplorable practices at their local shelters. Providing hope and a road map for lifesaving, grassroots companion animal advocates embraced the message of Redemption and Irreconcilable Differences, and the No Kill movement gained new life. At the same time, as a consultant I worked with shelters across the country, helping others achieve the same level of success, first Charlottesville, Virginia, then Reno, Nevada, and then several others, including Austin, Texas. Today, there are nearly 100 shelters across the nation representing about 300 cities and towns across America which, in spite of resistance and push back from the national organizations, have embraced the No Kill Equation, and, like Tompkins County, are saving between 90 and 99% of all the animals they take in. The No Kill movement is rapidly growing, gaining converts across the nation who are pushing for change in their own hometowns. But as welcome as this effort over the last six years has been, it has also been heartbreaking, revealing an even deeper layer of dysfunction within the animal sheltering industry. As the movement to end shelter killing has grown in size and sophistication, the networking made possible through the internet and social media has allowed animal lovers to connect the dots between individual cases of animal cruelty and neglect in shelters nationwide. These incidents reveal a distinct pattern. Animal abuse at local shelters is not an isolated anomaly caused by “a few bad apples.” The stunning number and severity of these cases nationwide lead to one disturbing and inescapable conclusion: our shelters are in crisis. Frequently overseen by ineffective and incompetent directors who fail to hold their staff accountable to the most basic standards of humane care, animal shelters in this country are not the safe havens they should and can be. Instead, they are often poorly managed houses of horror, places where animals are denied basic medical care, food, water, socialization and are then killed, sometimes cruelly. The first time many companion animals experience neglect and abuse is when they enter the very place that is supposed to deliver them from it: the local animal shelter. It is a tragic story true to cities and towns across this nation. And the large national animal protection organizations are as much to blame as the individual shelter directors themselves for not only have they fought lifesaving innovation at shelters, they have enabled the neglect and abuse of animals in shelters, too. For decades they have perpetuated the fiction that all is well in our nation’s shelters. They have assured us that they are overseeing these organizations, providing guidance and assistance to make sure they are run humanely and effectively: through their shelter assessments, their national conferences and their publications for sheltering professionals. In reality, they have ignored abuse, failed to create substantive standards by which to measure success and hold directors accountable and remained deafeningly silent regarding the cases of abuse occurring at shelters nationwide. In short, they have failed the public. Over the past 100 years, Americans have trusted these groups to oversee our shelters, writing them checks to do the job while looking the other way because the “experts” were in charge, and in so doing, have allowed our shelters to remain virtually unsupervised and unregulated for decades, with devastating results. In fact, excluding laws imposed by health departments regarding the use of controlled substances, the disposition of rabid and “aggressive” animals and mandated holding periods, shelter directors in this country have essentially unlimited discretion as to how they operate their facilities. If a shelter director decides to kill each and every animal even if there are empty cages, it is legal for him to do so. In fact, many shelters routinely keep banks of cages intentionally empty so that their staff does not have to clean those cages or feed the animals inside them. If a non-profit rescue organization wants to save an animal on death row at a shelter, the shelter director has the authority in every state but two to deny the group the ability to do so, and they frequently do. Likewise, shelter directors can kill orphaned kittens and puppies rather than work with volunteers who want to provide foster care. They can ban volunteers from walking dogs and socializing cats. And they can limit the number of hours they are open to the public for adoptions, or have hours that make it difficult for working people to reclaim their lost animals or adopt new ones. There are no checks and balances to ensure that our shelters are run in line with the most up-to-date sheltering policies and procedures. Instead, our shelters are run on the honor system, and it is a discretion shelter directors abuse time and again by failing to ensure the humane and compassionate care of animals in their charge, to implement readily available lifesaving alternatives or to work cooperatively with those who want to help them save lives. And almost without exception, whenever animal lovers have questioned this arrangement, developed innovative and compassionate alternatives to killing or have brought the need for greater regulation to light, the large national animal protection groups have opposed them. They argue that such reforms are unnecessary, and that, paradoxically, any alternative to killing or any form of regulating shelters to ensure that animals are treated with compassion and are not needlessly killed is not only unnecessary, but will actually put animals in harm’s way. 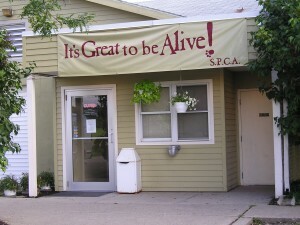 When a statewide survey found that 71 percent of rescue organizations reported that they were turned away from New York State shelters and then those shelters killed the very animals those groups offered to save, the ASPCA fought to maintain the status quo, defeating legislation that would have given rescue groups the right to save at private expense, the animals shelters are killing at taxpayer expense. When animal lovers in Texas tried to end the practice of gassing animals, a slow and exceedingly cruel way for animals in shelters to be killed, a coalition of animal control groups led by HSUS defeated the bill. Even though the Virginia Animal Control Association defeated legislation to end the statewide practice of killing animals when there are empty cages, when rescue groups are willing to save them and in the case of feral cats, when they can be neutered and released, PETA supported their cause and the National Animal Control Association (NACA) gave them an award for “Outstanding State Association.” When a Louisiana shelter killed every single animal in its facility, including cats, because a handful of dogs contracted a mild illness which clears up on its own, HSUS defended them. In Hillsborough County, Florida, despite the fact that the shelter’s then-director killed animals in order to keep cages empty, the ASPCA stepped in not to encourage reform, but to buy them a new “euthanasia table” on which to kill animals. And when a shelter in Reno, Nevada, finished the year saving a higher percentage of animals than virtually every other community in the nation, the American Humane Association encouraged them to take a giant step backward and enact a punitive cat licensing scheme which could have led to the round up and killing of cats. Whether by coming to the defense of regressive shelter directors, working to defeat progressive shelter reform legislation, fighting new and innovative programs to save lives, or calling for the wholesale slaughter of entire groups of animals in shelters, HSUS, the ASPCA, PETA and other animal protection groups are the biggest barrier to ensuring the survival of animals in shelters today. 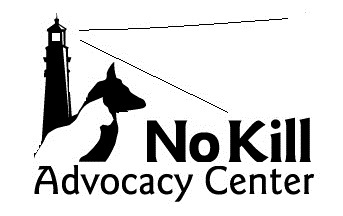 The No Kill movement seeks to change this tragic reality by bringing standards and accountability to a field that has historically lacked it, by exposing the truth about our shelters, by calling for the replacement of poorly performing shelter directors and by seeking legislation that legally mandates common sense procedures that shelters should already be following. Where laws mandating lifesaving policies and procedures have passed, greater lifesaving has immediately followed. Legally requiring shelters to do what they refuse to do is the quickest and most effective means animal lovers have to reform our nation’s shelters, and to orient them toward lifesaving and away from killing. 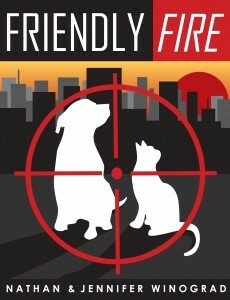 Yet, as I document in detail in my most recent book, Friendly Fire, whenever and wherever animal lovers mount campaigns for reform or seek legislation, the opposition of HSUS, PETA and the ASPCA hinders their efforts. Too often, animal lovers, the media and legislators become confused and cannot see beyond the names and reputations of these organizations to discern their true motives. Too often, the opposition of animal protection organizations sows seeds of doubt regarding the need or nature of common sense reform and efforts falter or fail. We are a nation of animal lovers, and we, and the animals we love, deserve better. We deserve shelters that reflect our progressive and compassionate values, not thwart them. We now have a solution to shelter killing and it is not difficult, expensive, or beyond practical means to achieve. Only one thing stands in the way of its widespread implementation: a deeply troubled and dysfunctional animal protection movement that undermines the effort at every turn. If we are to prevail, we need to neutralize its harmful and deadly effect. By explaining the nature of this opposition, by exposing the history of these groups and the actions they take which undermine the cause of No Kill–I hope to inspire in others—animal lovers, public officials, legislators, the media—the confidence and courage necessary to see through, and stand up to, those who seek to delay and derail urgently needed shelter reform. Through the No Kill movement, we can create a country in which it is illegal to kill animals who enter shelters. We can create a country in which children are raised with higher expectations for the treatment of animals—and an understanding and acceptance that animals have legal rights. And we can establish powerful advocates for the well-being of animals in every community by reclaiming the thousands of shelters across our nation, and reorienting them away from killing and back to their founding missions: to advocate for and save animals. That there are those who choose to portray my efforts to reform the animal protection movement as an effort to sabotage it is regrettable, though predictable. My hope is that anyone inclined to believe those who seek to undermine my efforts by disparaging my character and my motives will read my story and not only reject their baseless accusations, but join me in my fight as well. * I’ve never bred an animal and I’ve never promoted the breeding of animals. I support laws banning the sale of purposely bred animals from pet stores. I’ve held workshops on closing down puppy mills. I’ve written articles about it. I do NOT support mandatory spay/neuter laws because they do not work. They cause animals to be impounded and killed. My opposition is not philosophical. If they did work, I would support them. That said, I do not believe in the myth of pet overpopulation and neither should any true animal lover. Not only is the evidence not there, but the fact that it is a myth means we have the ability to end the killing today. That is news we should all celebrate. But, regardless of why animals are being killed, they are being killed, and as long as they are, people should adopt from a shelter.